I drafted the waistband today. Drafting was a simple affair; I just laid the skirt on some tracing paper, and drew along the line of the waist. I wanted my waist band to be 2″ thick, so I extended 2″ from my traced line, then added seam allowances. To draft the back of the waistband, I split the pattern at CB, and added a half inch seam allowance to one piece, and an inch and a half to the other to give lappage for my buttonholes. Sounds simple, right. Except that I didn’t line up the edges properly when I sewed it in. Oh well. That’s what seam rippers are for, I guess. Since my pinstriped skirt requires a zipper, I thought this might be a good time to do a quick post on zipper installation. 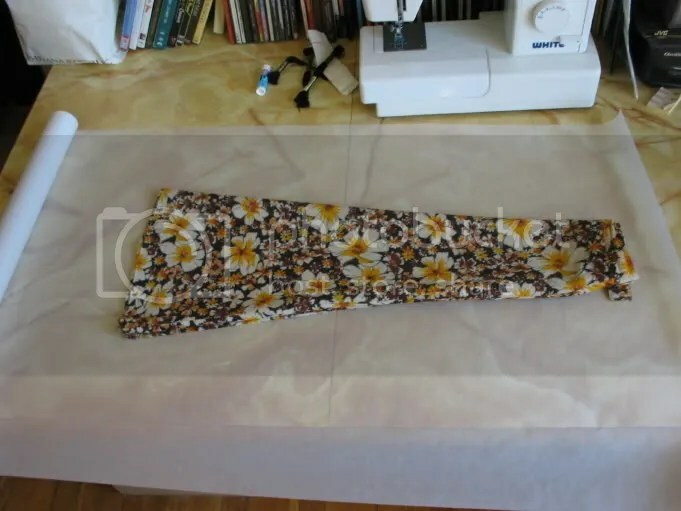 There are two basic ways to sew in a zipper: a lapped installation, and a centered installation. A lapped installation is usually found on pants fronts — it means that one edge of the fabric laps over the other, hiding the zipper tape. In a centered installation, which is what I’m doing, the zipper is installed between two equal folds of fabric which meet in the center of the zipper. This isn’t a typical installation, since I’m not installing the zipper directly to the fabric pieces, but rather to the backing tape that my bound fashion fabric will be attached to. So I haven’t been doing too much work lately on my current project — my trip intervened (and I did manage to whip up a skirt with the Malaysian fabric I picked up at the State Department book sale; photos to come). I brought it back out today, and I have two comments about tools. With this little gizmo, you feed the flat fabric in one end, and it comes out the other end folded around — you just have to press the creases in. The second comment regards presser feet. For the longest time, I’d had my zigzag presser foot attached to the machine for any kind of regular straight stitch sewing. I mean, no reason you can’t stitch a straight line with the zipper foot, right? Well, but I’d always had trouble with very tiny seams and topstitching. If I was stitching close to the edge, the edge would creep up into the little well of the zigzag foot. I pulled out the regular straight stitch foot the other day, and it was a revelation. Perfect topstitched seams, less than 1/16 inch from the edge. Um. Well. D’uh. That’s why they give you a different foot for straight stitching. The first work in progress that I’m documenting here is a recycling project — a simple A-line 8 gore skirt made from some recycled pants. Here’s a simple sketch of the concept. The skirt has a satin ribbon waistband and lace trim at the hem. You are currently browsing the archives for the 8 gore pinstriped skirt category.